Einkorn, an ancient grain, actually, the most primitive of grains we know of, and you guys know how I love old stuff. You can’t get much more old-fashioned than that, can I get an amen? After recently having food testing done, I discovered I’m sensitive to gluten, but guess what, I can handle ancient grains without having my body react. I’d already been using Spelt and grinding my own flour for most of our baking for years now, but now I know I need to become dedicated in my use of ancient grains. But what exactly is it that makes these ancient grains better and easier for our bodies to handle. How have they changed over the thousand of years to the modern version that so many people are having issues with? So glad you asked, let’s dive in! Ancient grains are considered forms of grains that haven’t changed forms in hundreds or thousand of years. In regards to wheat, ancient grains typically have higher protein and less gluten. Some forms of ancient grains are Einkorn, Spelt, and Emmer. Einkorn is a German word that refers to a single grain. If you see wheat in the field maturing, it has two sides, making a square of two seeds on each side. Einkorn is very flat because it only has one grain on each side. It’s more similar to a grass, but it’s larger of course. 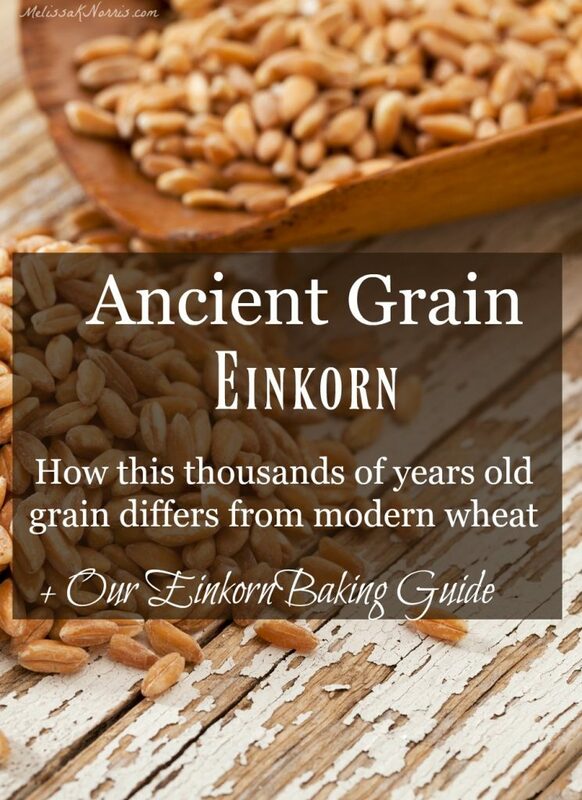 Einkorn is the original form of wheat, the most primitive form of wheat that we know of in the earth. It’s closer to grass. With the taxonomy of wheat you go back to the diploid species and Einkorn has 14 chromosomes where modern wheat has 42 chromosomes. Modern wheat has naturally hybridized over time to become what it is today. Same with Spelt it has hybridized from grass, making it still an ancient grain, but not as “ancient” as Einkorn. Einkorn is the most primitive form of wheat we know of and it’s health benefits alone make it a flour and grain everyone should know more about. Einkorn is out of reach for many people, as it’s not readily available or for sale in most grocery stores. In fact, I’ve only been able to find it online, but thankfully, we have a special coupon so you can get free shipping and delivery straight to your door. Knowing how to alter recipes and bake with fresh ground flour is a whole new experience. It took me 8 weeks to get an edible loaf of bread when I first started with fresh ground flour and ancient grains. Get our video e-course lesson on grinding your own flour and baking with it, and highlight lessons on ancient grains Spelt and Einkorn in The Pioneering Today Academy. Einkorn is higher in anti-oxidants, riboflavin, and lutein. Einkorn has less phytic acid than regular wheat. Phytic acid is a natural part of nature that you have to break down in order for your body to absorb and get the nutrients out of the food. Einkorn has about 50% less phytic acid than modern wheat. Which means your body is better able to absorb the goodness. *Heads up, though Einkorn does contain less gluten and a different form, it does contain gluten. While many people with gluten sensitivities have found success with Einkorn, if you’re a Celiac patient or under the care of a physician, please check with them before trying. There are some definite learning curves with using Einkorn as well as fresh ground flour. The tips below will help you with Eiknorn baking, but if you’re new to fresh ground flour, check out this article Baking with Fresh Ground Flour for additional tips, aka, ain’t nobody wanting rock hard bricks of bread, right? If you’re adjusting a regular recipe to Einkorn flour, start with 1/2 the amount of liquid (not the fat, just the liquid). Add an extra egg to help act as a binder with the more fragile gluten content in the Einkorn. Don’t knead the dough, mix until incorporated and let sit for 10 minutes. Einkorn will continue to absorb the liquid, this wait time is crucial so you don’t add too much flour. After the 10 minutes, add more flour if needed. When there’s a lower gluten amount, and in the case of Einkorn different, kneading destroys the fragile gluten strands. Einkorn is a much stickier flour. Don’t keep adding flour. To handle the dough for form rolls, loaves, etc. coat your hands and/or the counter with either a light layer of olive oil or coconut oil instead of using extra flour. Shorten your rise time. If using store bought yeast, shorten the rise time by half. If using traditional sourdough, increase the amount of flour your feeding it with so it can reach the full fermenting time. Batter type baked goods may tend to take a little bit longer to bake. Einkorn is lighter in color, so make sure you don’t burn it if you’re used to using whole wheat or fresh ground flour.